Actually white tea is green. It is said to be the finest tea type and is also called “Water Spirit” or “White Peony”. It comes from the high mountains of the Chinese province Fujian. Only the youngest leaves are harvested to ferment at low daylight. They are shortly heated and eventually air-dried. 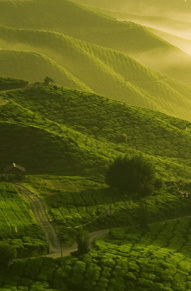 The selection of the harvest makes the tea to an exclusive beverage. Its excellent quality owes the tea its harvest: Up to 30.000 leaf buds need to be picked to gain one kilo tea. Its lovely and sweet aroma tastes delicate and fresh. “Baimudan” or also “White Peony” from the province Fujian is picked in fall shortly before the leaf buds open. The tea is drinkable when it reaches a pale yellow colour and the fresh aroma is given complete expression to a fine and delicate taste. This tea also comes from the province Fujian. While infusing the tea a pretty spectacle of the needle-like leaves starts: First the thin leaves swim horizontally on the surface then they slowly turn straight before they slowly sink to the bottom. The taste is velvet, soft and elegant.